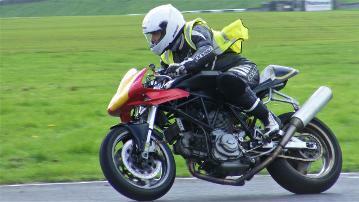 A Ducati 800SS rebuilt to meet the Stock Twin racing class with ThundersportGB. It was originally built to allow it to also race in the naked 'Streetfighter' class also hence the lack of full fairing. The frame is lightened and modified. The engine is standard though it is fitted with MADASL Racing intake trumpets and one of our spaghetti header systems. Fast Bikes reviewed this bike in their September 2013 issue.